Woody’s are pleased to offer the new F.X. 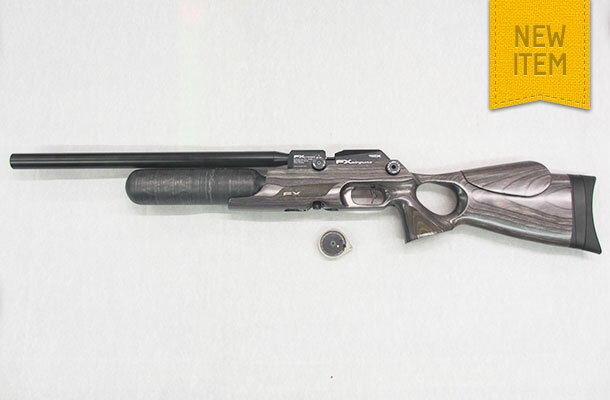 “Crown” pre-charged air rifle. This rifle is available with gunstocks of either Black Pepper, Blue or Forest Green in a laminate material or in Walnut. These guns are at present in very short supply but we do aim to keep the black pepper, blue and green laminate stocked guns “off the shelf”. We would suggest you ring us before you set out to check our stock position Just check out the features below. – Smooth twist x barrel system (with interchangeable core barrel liner to allow for various twist rates). – 18 shot Magazine .22 caliber / 21 shot .177 caliber. – Match Grade Free Floating Barrel. – Supplied with hard case.